Josh Hoyer opens the show at 9pm. Don’t be late! 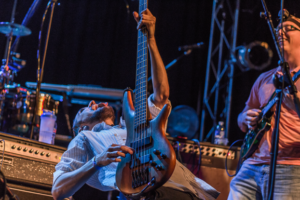 Funk Trek is a funk/jazz fusion band formed in 2008 in Omaha, Nebraska by cousins Tom Murnan and Daniel Pflug, with guitarist and friend Andrew Wahl. Funk Trek has released three studio albums, the most recent being “Quencher” released on July 10, 2015.